As Marcus Tullius Cicero famously remarked, "A room without books is like a body without a soul." 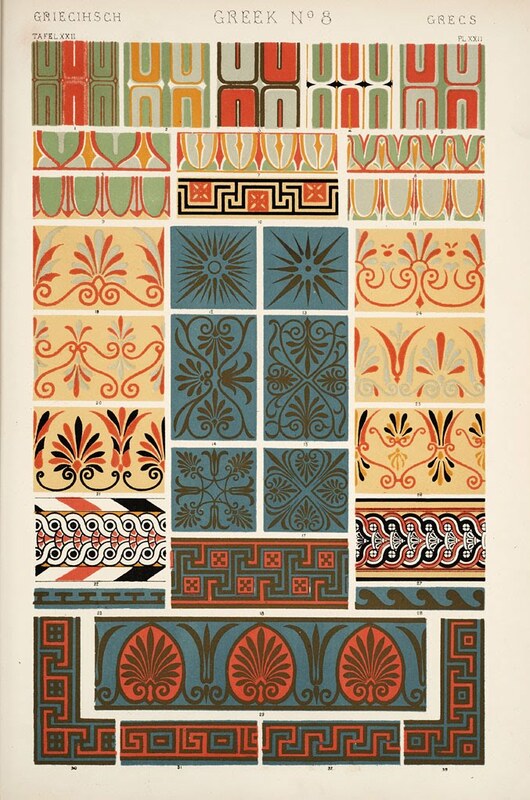 A couple thousand years later, architect and designer Owen Jones took a page from that same volume and said, "Form without color is like a body without a soul." Since we'd all like to keep body and soul together, (at least until the time comes to sell the latter to Satan in exchange for eternal youth, big bucks, and turning Angelina Jolie and/or Brad Pitt into our devoted love slave), spending some time with Mr. Jones's gorgeous "grammar" of design seems like a good way to make sure our physical and spiritual selves don't end up sleeping in separate bedrooms. London-born Owen Jones was the son of a furrier, whose real passion was collecting, recording, and publishing Welsh literature and folklore. Although his antiquarian father died when Owen was only five years old, a love of books, history, and the written word was in his blood. Young Owen became fascinated with the study of design and architecture across the centuries, and throughout the world. Having completed his education at the Royal Academy School in architecture, in 1832, Jones continued his studies with the Victorian gentleman's equivalent of the finishing school, the Grand Tour. Jones had been trained in the plain, vanilla style of Neoclassical architecture. In the 1830's, however, studies began to suggest that Ancient Greek buildings were originally multi-colored. 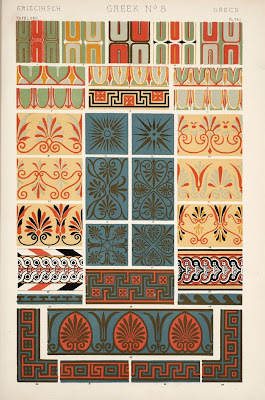 Owen Jones was one of many ambitious, young scholars who were delighted with the new found concept of "architectural polychromy." After spending four years visiting Italy, Greece, Egypt and Turkey, he found his true inspiration in Spain, beginning a complete study of the Alhambra Palace in roughly 1835. Documenting this 14th century Moorish citadel that overlooks Granada became Jones's obsession for the next 10 years. Spellbound by the beauty of Spanish Islamic design, Jones spent six months observing and meticulously recording every design element of the palace, producing hundreds of drawings and plaster casts. (He was aided in this task by fellow architect Jules Goury, who tragically died of cholera in 1834.) Upon his return to London, he faced a new obstacle. 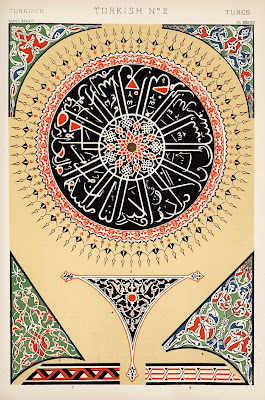 The current state of color printing could not accurately reproduce the intricate detail of his drawings. 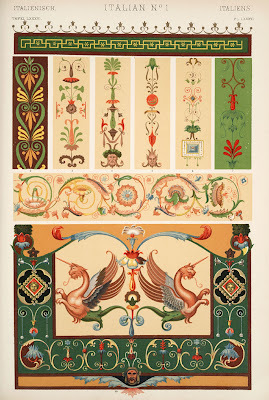 Undaunted, Jones worked with chemists and printers, and produced the first book to make significant use of the new process of chromolithography. 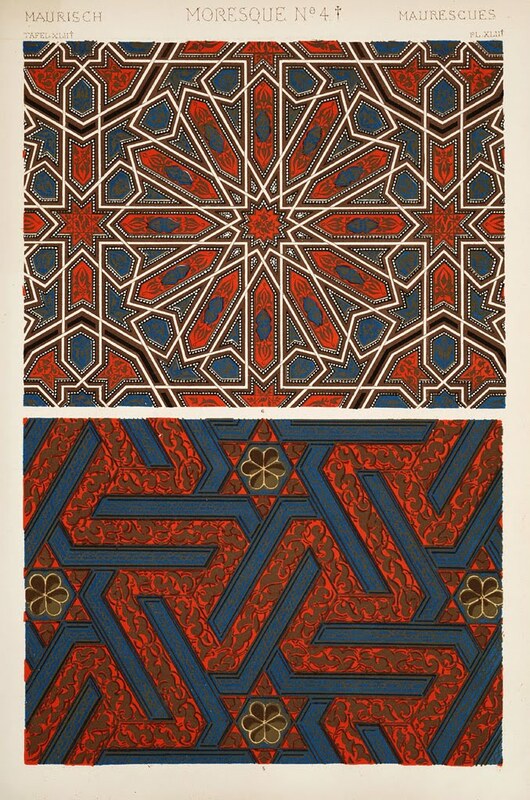 Plans, Elevations, Sections and Details of the Alhambra was printed in twelve parts over ten years (1836-1845), and established Owen Jones as an expert in the theory and practice of architectural design and ornamentation. 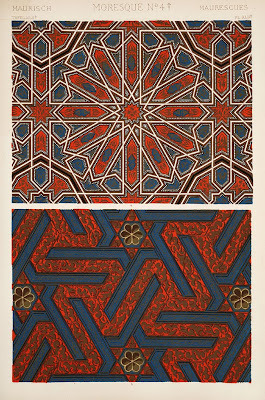 Galvanized by the tilework of the Alhambra, Jones began to study mosaics, collages, and the natural formation of tessellations in honeycombs and on the ocean shores of Tasmania. 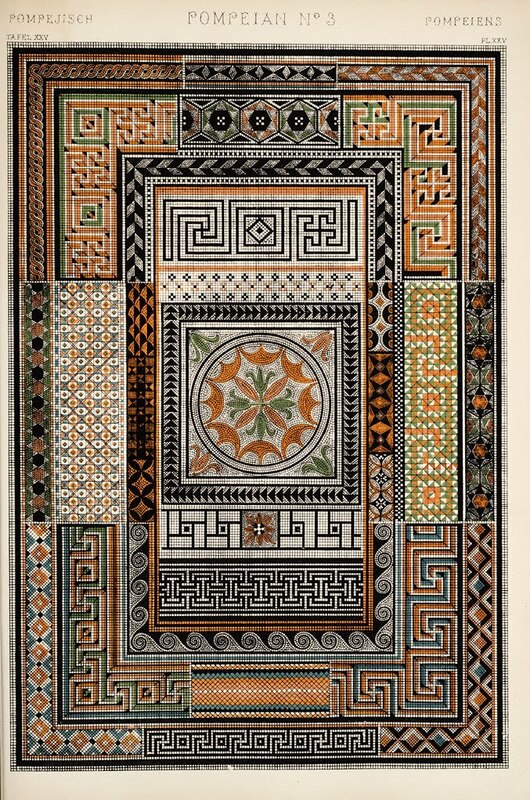 This work became the basis for Jones's original tile designs, which in turn led to a commission from Prince Albert to design the interior of the 1851 Great Exhibition building. Jones devised an interior that was as simple as it was radical: only the three primary colors, red, yellow, and blue, would be part of the design. This extreme departure from the usual Victorian aesthetic was highly controversial, and sharply criticized during its planning and development. But once the building finally opened, it was a huge success, viewed by over six million visitors. When the Great Exhibition ended, Jones was given the task of selecting its finest objects for study at London's first Government School of Design. He then used these hand-picked examples to create a teaching collection based on his own concept of an all new "modern style" for the 19th century. 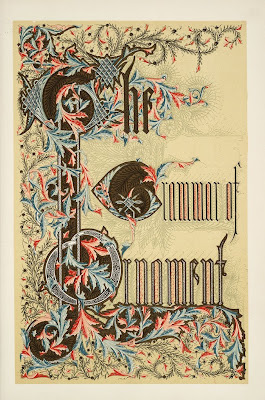 The School of Design collections, collectively known as the Museum of Ornamental Art, were eventually moved to a site in South Kensington that had been bought through profits from the Great Exhibition. This in turn eventually became what is now the Victoria and Albert Museum. As Owen further refined his design theories, he became frustrated at his inability to reach beyond the classroom. He saw the design world around him slavishly recreating classical and Gothic motifs with little understanding of their cultural and religious connotations. 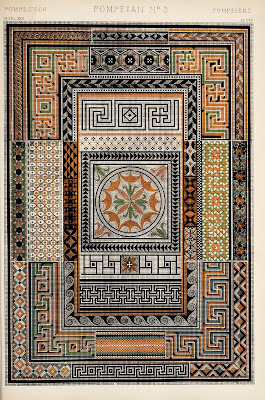 He became convinced what was needed was a sourcebook of the best designs of ornament and decoration from other cultures and eras based on the sound use of color, geometry, nature, and abstraction. 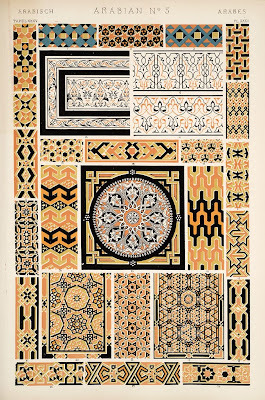 This became his seminal and hugely influential book, The Grammar of Ornament. 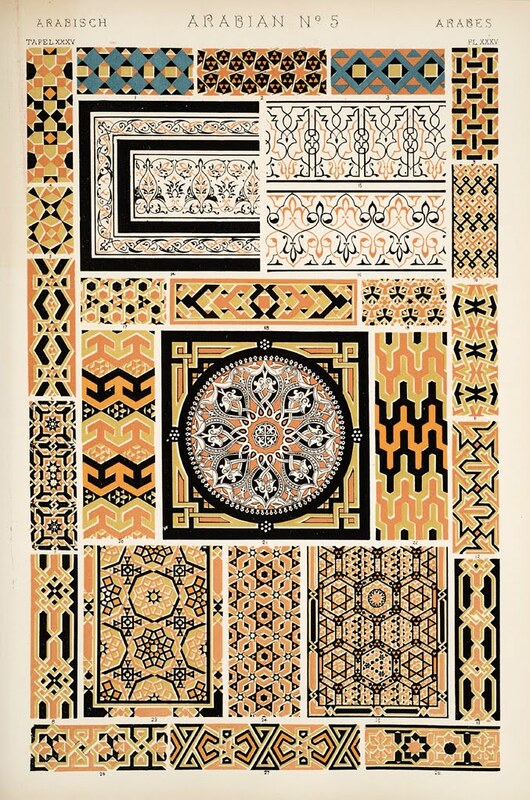 Owen Jones created a whole new language of modern design that applied equally to wallpapers, textiles, furniture, metalwork, and interiors. It was eclectic, democratic, and global, drawing on nineteen different cultures from tribal Oceania, ancient Greece and Rome, Byzantium, Persia, Turkey, Medieval Europe, Renaissance Italy, and Celtic Clans to his beloved Moorish Spain. 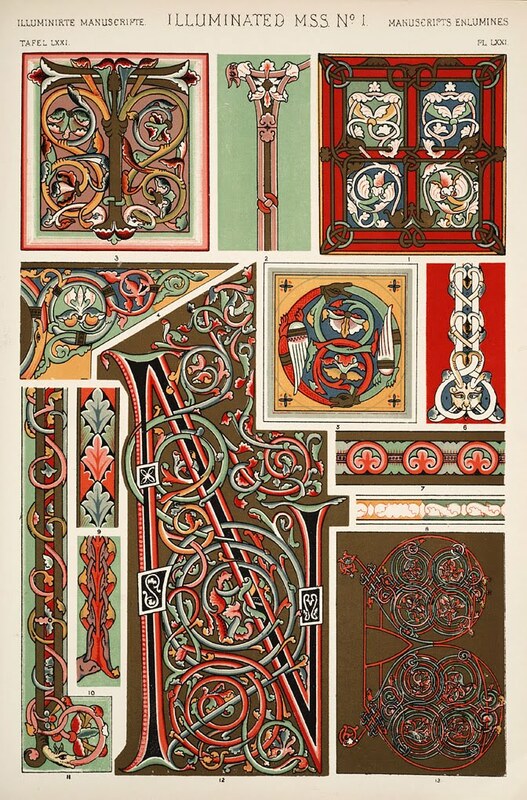 His design philosophy can be seen in microcosm in the frontispiece he created for The Grammar of Ornament, which combines Greek key scrolling, medieval manuscript lettering, Celtic interlacing and Islamic ribbed motifs into a harmonious whole. The volume contained over 100 meticulously lithographed color plates, the original drawings for which are held, fittingly, by the Victoria and Albert Museum's Library. Since its publication in 1856, the book has never been out of print. 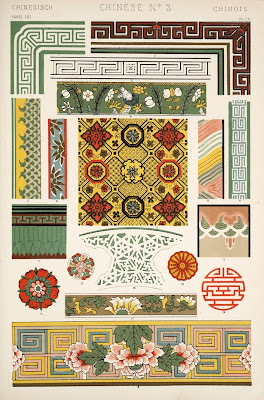 Throughout the second half of the 19th century it was the single most influential design sourcebook in the world. 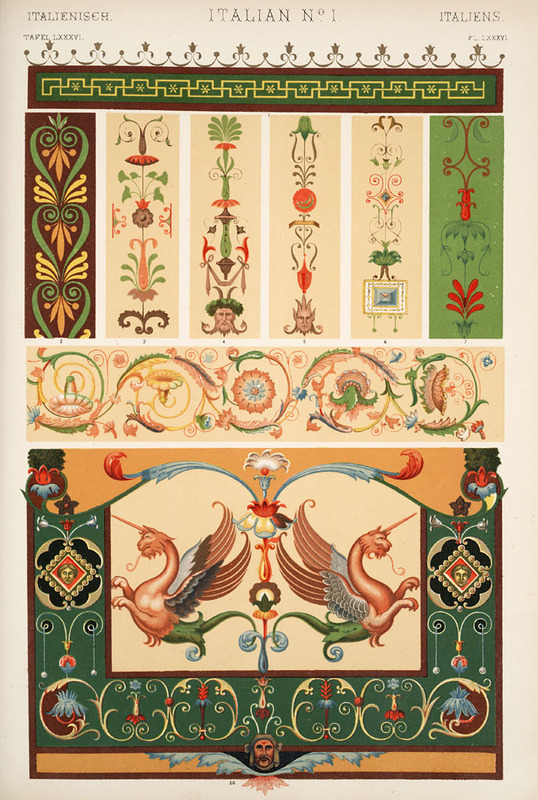 Along with his painstaking and precise color plates, The Grammar of Ornament also contained 37 strict guidelines for the proper use of design elements in art and architecture. 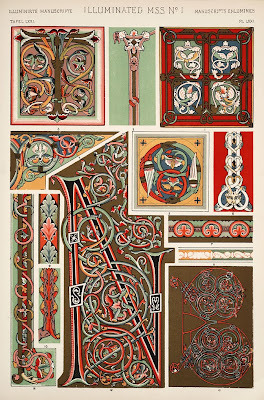 These included the belief that decoration must arise organically from architecture, ("Construction should be decorated. Decoration should never be purposely constructed. "), and that architecture and the decorative arts must "possess fitness, proportion, harmony the result of which is repose." The final of these "propositions" states, "No improvement can take place in the Art of the present generation until all classes, Artists, Manufacturers, and the Public, are better educated in Art, and the existence of general principles is more fully recognized." 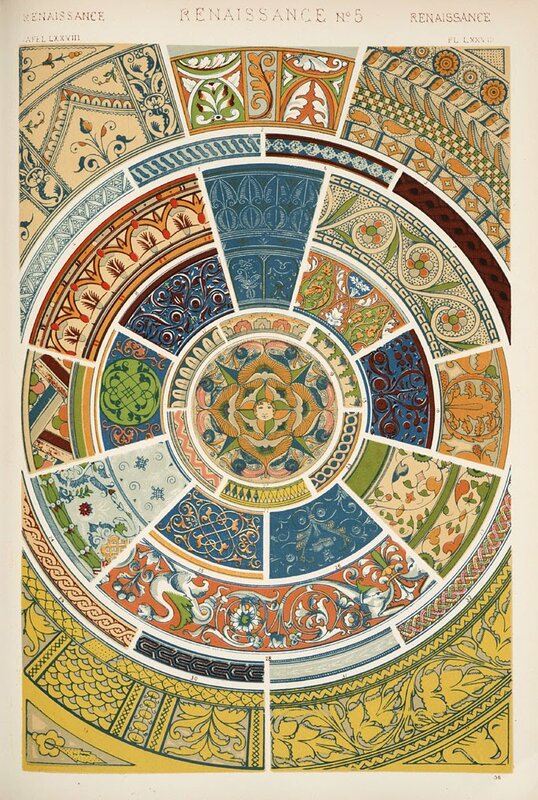 Owen Jones did not live to see his ideas taken to heart in the more streamlined, multicultural aesthetics of the Arts and Crafts Movement and Art Nouveau. 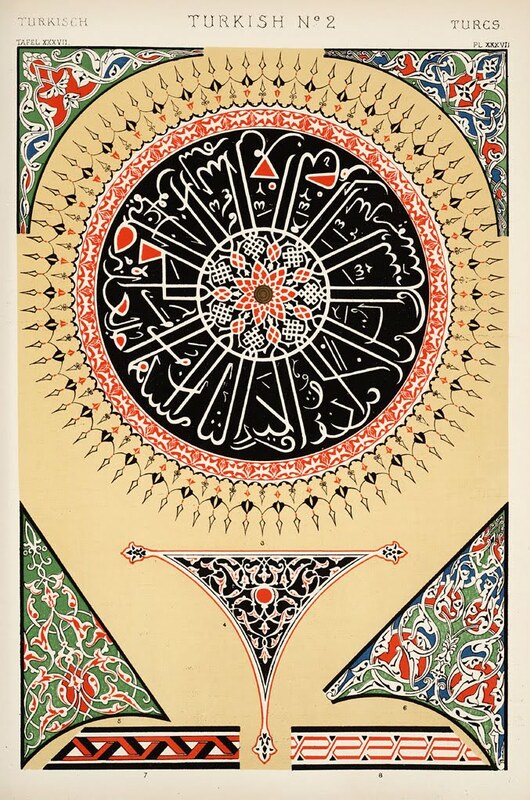 Instead, he saw many of his contemporaries adapt the most extravagant elements of book's color plates into the overstuffed, over-decorated, and overwhelming drawing rooms of the Victorian nouveau riche. But over time his grammar did become more fully understood, and it remains a core text for interior designers to this day. As novelist Anthony Powell once said, "Books do furnish a room." The Grammar of Ornament alone has furnished thousands. 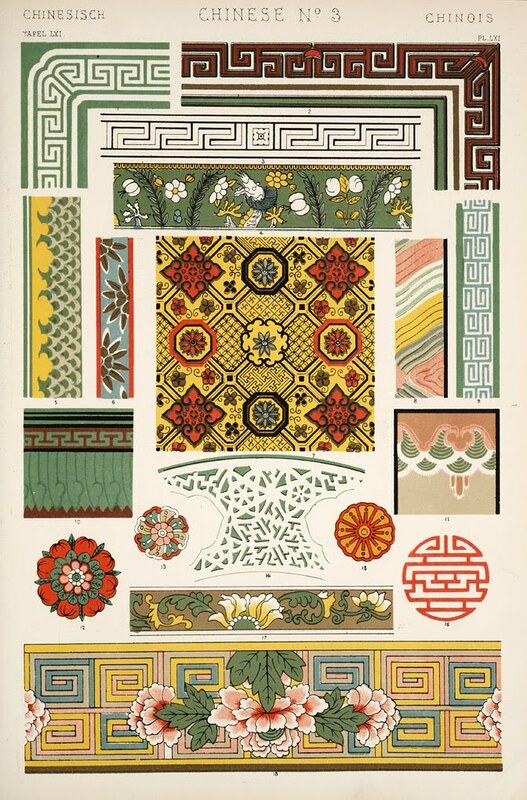 The full text of the 1910 edition of The Grammar of Ornament has been digitized by University of Wisconsin's Digital Library for the Decorative Arts. 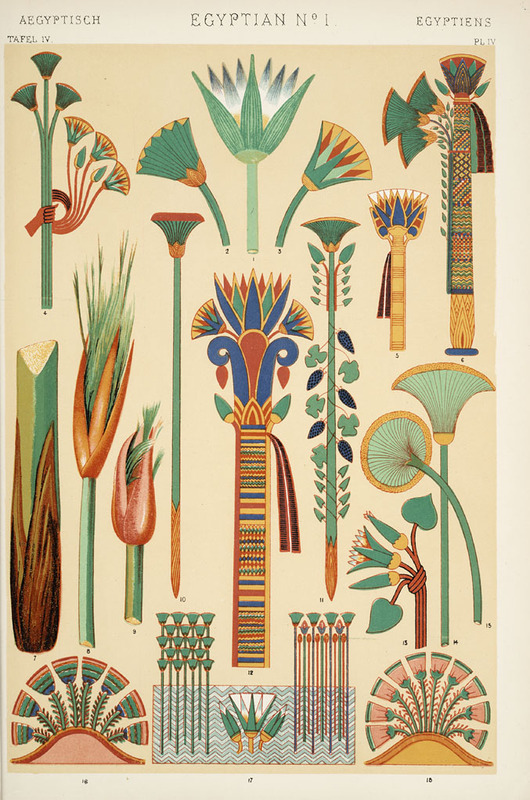 And some of Owen Jones's original drawings have been digitized by the Victoria and Albert Museum.